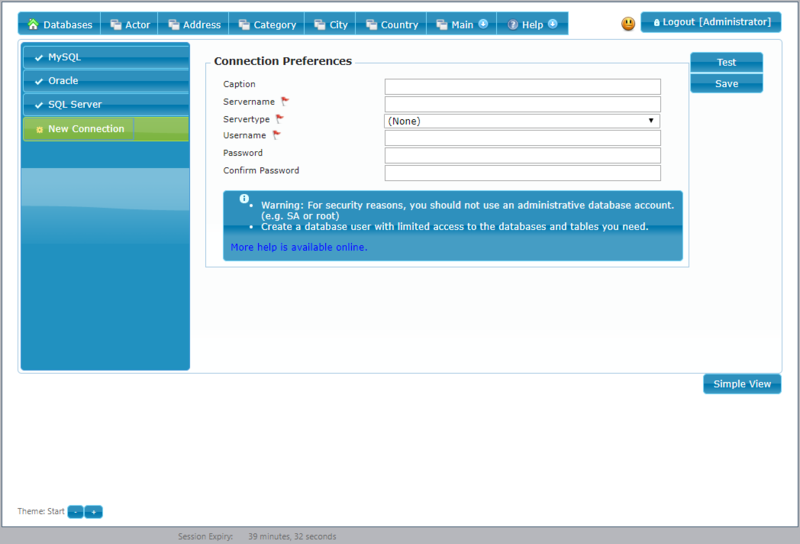 Before you can add a database connection you will need access to a database account. You can use any account with enough privileges but it is better to create an account specifically for this purpose. A special purpose account will enable you to lock it down so that if there is a security breach then it will give the attacker the least possible privileges. Other than the normal table privileges, this account will also need to be able to read the object definitions. Once you have access to a database base account then creating the database connection should be straight forward. Username: The account created in the step above. Password: This needs to be entered twice. You can additionally create a more friendly caption for the database connection. This will be visible to other admin users. The button named "Test" will test the connection without saving it. The "Save" button will save the connection after first validating it. If you ever need to update the connection credentials or caption then this can be done from the Connection Properties dialog. You will be required to enter the connection password to verify your access. Once the database connection has been setup, one of the next steps would be to specify which users have access to that connection. You might want to wait with that step until your application is ready. To manage the access to your application please see: Connection Access.